Last night, I headed to bed early and I was looking through photos from this time last year and I realized how different things were. I could immediately feel the exhaustion and the symptoms of the first trimester that soon faded off throughout the summer. I saw myself and Mike and I as a couple being so wide-eyed and looking for direction in those photos. It was so interesting to look back at who we were in those weeks we were here last year. Now as we take the same walks each day, go down to our favorite places (like the beach) and up into Leelanau County, I am taking in who we are now. We are wide-eyed still but in a way that is full of direction, purpose, and hunger to chase life in the way we hoped we would know how to last year. We have a sweet little 4-month old who is loving life up here and cannot get enough of the woods and outdoors. We are parents. We are intentional. We are more empathetic. We are more patient. We are more compassionate. We know what we want and more of who we are and are meant to be in this world. Seeing the difference a year makes has been a refreshing reminder that no moment in life is ultimate and we are always in process. Moments can at times not last long enough and sometimes last too long. So even here, where we are chugging through the process of launching our new site on top of our normal work, getting ourselves in a good rhythm, and having a 4-month-old who is figuring out sleep, and so on I have faith that even in my exhaustion this won’t last forever. There will be parts next summer I will miss and some I will be glad were in that season, but ultimately these moments are fleeting and worth holding onto and finding room to breathe within. 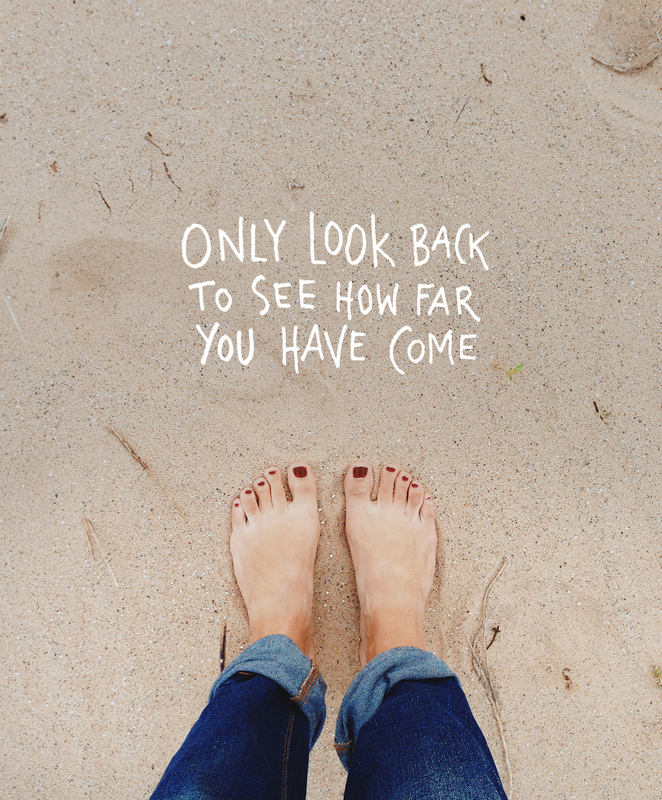 I am not sure what your week holds, but if it feels stacked and full and maybe a little off, I suggest you look back for just a second and see how far you have come. Think about yourself a year ago standing in your kitchen, who were you? Have you become better? What have you achieved? What did you move past? What things still stand in your way? Looking back at yourself in the same place you were a year ago tells us so much of who we are shaping into and what work still has to be done and what has already been achieved. It is important to find a balance between the present, but looking back as often as we do forward is just as important. So tell us, this time last year who were you, where were you? What has changed? Such beautiful words! I love doing this from time to time and even more i love everyday and how different i’ve become – always better. Last year i feel like i was 10 years younger! I was so impatient, all over the place but doing so much at once, always on the move. Now i feel more conent, patient and loving life and doing EVERYTHING slowly and MINDFUL. Wow i really enjoyed reading this post! I have been fighting POSTPARTUM depression for months and have been trying to Perfect my mindfulness. It is so important as you MENTIONED , to be “intentional”. With depression you can get so BOGGED down by the past happy times compared to how low you feel now. When you set an intention for looking back to only coNcentrate on how far you have come, what a change for the better, more then likely, will your mood be! Thank you this Has helped me!